Mansilla, J.P., Pintos, C., Chaves, M., Rial, C., Aguín, O. and Salinero, C.
Among the disease causal agents in woody plants, fungi appear to present the greatest potential threat. One of the most widely distributed and economically important groups of pathogenic ascomycetes belongs to the family Botryosphaeriaceae. They have a cosmopolitan distribution and a wide host range including gymnosperms and angiosperms (Denman et al., 2000). These fungi are common endophytes and latent opportunistic pathogens, principally causing diseases under unfavorable environmental conditions. Botryosphaeria spp. are associated with various diseases symptoms, but are best known as canker and die-back pathogens on woody plants. In Spain several species of Botryosphaeria have been detected in multiple hosts such as oak, grapevine, olive, avocado, eucalyptus, pistachio, rhododendron and this list continues to expand (Luque and Girbal, 1989; Sanchez et al., 2003; Armengol et al., 2001; Pintos et al., 2011a; Romero et al., 2005; Moral et al., 2010; Zea-Bonilla et al., 2007; Armengol et al., 2008; Pintos et al., 2011b). Some Botryosphaeriaceae species have also been reported worldwide for Camellia spp. Plants affected show canker dieback and leaf spots (Figure 1) (Duke, 1983; Buckley and Gould, 2000; Cunnington et al., 2007; Bush, 2009). Currently, Neofusicoccum luteum and Neofusicoccum parvum have been identified on Camellia japonica for the first time in Spain (Pintos et al., 2012). In this paper we summarize the Botryosphaeriaceae species identified from Camellia spp. during 2013 in Galicia and the results of the experiments that evaluated their pathogenicity. Figure 1. Symptoms of Botryospaeriaceae species in Camellia spp. 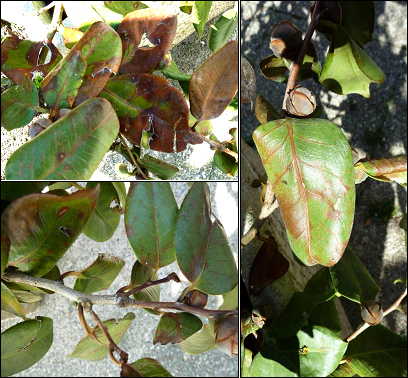 Samples of Camellia japonica and Camellia sasanqua plants showing canker, dieback and leaf spots were received and analyzed in the laboratory of Estación Fitopatolóxica do Areeiro. Camellia plants were collected periodically during 2013 and also came from individual customers. Samples of branches, shoots and leaves were collected from infected camellia plants. Wood and leaf samples were surface disinfected for 3 minutes in a 0.5 % sodium hypochlorite solution and washed twice with sterile distilled water. Small pieces of necrotic tissue were cut from the margin and plated onto malt agar (MA) amended with streptomycin sulphate (25 μg ml-1). Plates were incubated for ten days at 23°C in the dark. 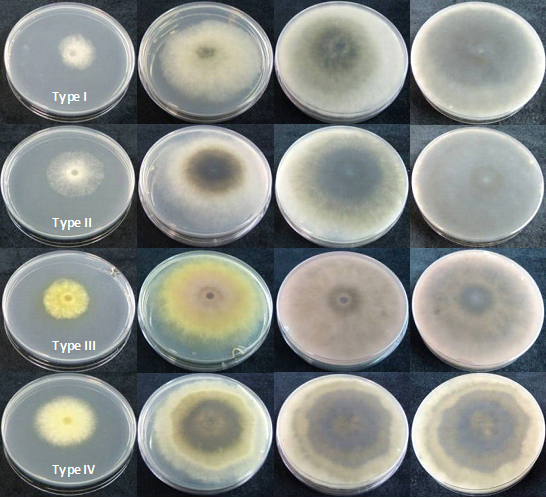 Representative fungal isolates displaying morphological characteristics associated with Botryosphaeriaceae species were subcultured onto 1% water agar (AA) containing autoclaved Pinus spp. needles and then incubated at 25°C under light (16 h / day) for 1-2 weeks to encourage pycnidium production (Crous et al., 2006). Single-spore cultures were prepared taking a conidiomata and crushing it in a drop of sterile water. One ml of water was spread over a PDA plate and germinating single conidia were transferred to a new PDA plate after 24 hours. The isolates were incubated on PDA for 24 hours at different temperatures and radial growth was measured on four pre-marked radii at right angles. Botryosphaeriaceae species were identified by cultural, physiological and morphological characteristics and confirmed by molecular analysis. Fungal DNA was directly extracted from mycelia growing on plates, using a commercial kit. PCR reactions were carried out with primers ITS1F and BOT2r (García et al., 2004) to amplify the ITS region. Products from PCR reactions were electrophoresed on a 2% agarose gel, then stained with GelRed, and visualized with a UV transilluminator. The size of PCR products was estimated by comparison with a 100 bp standard ladder (Marker XIV, Roche Diagnostics). Amplified products were sequenced with the same primers used for PCR reactions and analyzed in an ABI Prism 3130 Genetic Analyzer sequencer (Applied Biosystems). The sequences obtained were Blasted in GenBank. Pathogenicity of the four Botryosphaeriaceae species isolated from camellias was tested by inoculating twenty C. japonica and C. sasanqua healthy detached leaves. One representative isolate for each Botryosphaeriaceae species isolated was selected. The isolates were grown on PDA at 250C for 7 days prior to inoculation. Four detached C. japonica and C. sasanqua leaves per each Botryosphaeriaceae species and four controls were inoculated (Figure 2). A horizontal cut was made at the petiole base of each leaf. The leaves were introduced into eppendorf® tubes containing 1.5 ml of sterile PDA medium and a fungal colonized 6-mm-diameter agar plug removed from the margin of an actively growing colony (Figure 2). Four detached leaf controls received only sterile PDA agar plug. Plants were labeled and maintained in a chamber under controlled temperature (25 ± 2°C) and humidity (70-80%). The lesions were observed weekly. The aggressiveness of the isolates was determined after 17 days. Surface-sterilized leaf pieces taken from necrotic tissues were plated on PDA to complete Koch´s postulate. Figure 2. Artificial Botryospaeriaceae inoculation of C. japonica and C. sasanqua leaves. Artificial inoculations were conducted in November 2013. 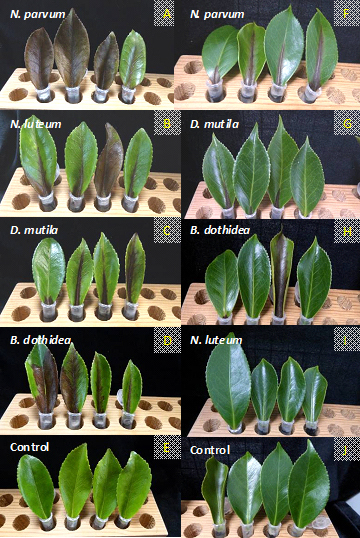 Pathogenicity was tested on twenty-five 2 year-old Camellia japonica and C. sasanqua seedlings growing in pots. One representative isolate for each Botryosphaeriaceae species (B. dothidea, D. mutila, N. parvum, N. luteum) was selected. A shallow cut was made in the stem of each plant. A colonized agar plug, from the margin of a growing colony of each Botryosphaeriaceae isolated, was inserted in every wound and was sealed with parafilm®. The control camellia seedlings received only sterile PDA agar plugs. Plants were labelled and maintained in a chamber under controlled temperature (25 ± 2°C) and humidity (70-80%). Figure 3. Artificial inoculations of Camellia sasanqua stems. Single-spore isolates produced four distinct types of colonies on Potato Dextrose Agar (PDA) at 22°C. The isolates type I (Figure 4.2) produced abundant white aerial mycelium, gradually becoming grey to dark grey. The reverse side of the colonies was initially white becoming dark green to olive green from the centre. This coloration gradually spread to the edge and became darker from the centre until the entire underside of the colony turned black. Growth occurred from 4 to 40°C with an optimum at 28°C. 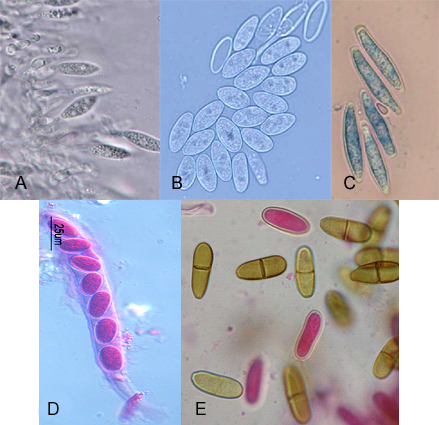 Conidia were hyaline, single or double cell, ellipsoid, with a sub obtuse apex and a truncate base, thin walled, averaging 23.03 (18.58 to 28.23) x 5.05 (3.96 to 6.63) µm with a ratio L/W of 4.62 ± 0.66 (n= 100) (Figure 4.1C). Type l isolates were identified as Botryosphaeria dothidea (Pennycook et al. 1985, Phillips et al. 2002, Crous et al. 2006). Type II isolates (Figure 4.2) initially produced dense white mycelia, the pigment becoming dark olive-brown. The reverse side of the colonies has the same colour. Growth occurred from 4 to 38°C with an optimum at 28°C. Conidia were hyaline, aseptate, eguttulate or sometimes with a large central guttule, contents granular, smooth, thick-walled, oblong to cylindrical, straight, both ends broadly rounded, rarely becoming brown and septate with age, averaging 27.38 (23.92 to 34.44) x 13.27 (10.76 to 15.81) µm with a ratio L/W of 2.07 ± 0.17 (n=100) (Figure 4.1.E). Isolates Type II were identified as Diplodia mutila (Luque and Girbal, 1989; Alves et al., 2004). The Type III isolates (Figure 4.2) produced a sparse aerial mycelium and a characteristic yellow pigment which intensified after 3 days, thereafter becoming violet-pink and gradually obscuring to dark grey. Growth occurred from 4 to 38°C with an optimum at 28°C. Conidia were hyaline, fusiform, aseptate, thin-walled, averaging 18.99 (12.75 to 23.25) x 6.39 (4.91 to 8.24) µm. Ratio L/W of 3.00 ± 0.44 (n=100) (Figure 4.1). Isolated were identified as Neofusicoccum luteum (Figure 4.1.D). (Pennycook et al., 1985; Phillips et al., 2002; Crous et al., 2006). Type IV isolates (Figure 4.2) were initially white, growing rapidly and forming a dense aerial mycelium that became dark gray. The reverse side of the colonies acquired yellow pigmentation that eventually became an olive colour, and finally passed to dark gray. The isolates presented a marked diurnal zonation. Growth occurred from 4 to 38°C with an optimum at 28°C. Conidia were hyaline, elliptical, aseptate, thin-walled, averaging 19.1 (15.26 to 22.84) x 5.73 (4.66 to 7.19) µm. Ratio L/W of 3.35 ± 0.34 (n=100) (Figure 4.1.A,B). Isolated were identified as Neofusicoccum parvum (Pennycook et al., 1985; Crous et al., 2006). B. dothidea and N. luteum were isolated from twigs; on the other hand, D. mutila and N. parvum were isolated only in symptomatic leaves of Camellia spp. The identity of the species were confirmed by DNA sequence analysis of the ITS regions. BLAST searches of I, II, III and type IV sequences showed 96-99% homology and 100% coverage with B. dothidea, D. mutila, N. luteum and N. parvum sequences obtained from GenBank Database. Figure 4.1 Morphologica characteristics of Botryospaeriaceae species. A, B Phialidic conidiogenous cells and conidia of Neofusicoccum parvum. C, Conidia of Botryospaeria dothidea. D, Ascus of Neofusicoccum luteum. E, Brown septate conidia of Diplodia mutila after discharge. Symptoms developed two days after inoculation and consisted of necrotic leaf lesions developed from the petiole base of the main vein towards the tip of the leaf. The most aggressive species was N. parvum. After two days necrotic lesions were already developed in C. sasanqua leaves inoculated with N. parvum and after four days in C. japonica inoculated leaves. The last leaves to show symptoms were those inoculated with B. dothidea on C. sasanqua (6 days) and N. luteum on C. japonica (9 days). The two camellia species tested differed in their susceptibility to infection by Botryosphaeria dothidea, Diplodia mutila and Neofusicoccum species. C. japonica leaves showed more tolerance of fungal inoculation from Botryosphaeriaceae family fungus than C. sasanqua inoculated leaves (Figure 5). After ten days C. sasanqua leaves were already necrotic: the C. japonica leaves were necrotic after 17 days. All Botryosphaeriaceae species were re-isolated from detached inoculated leaves but not from the controls, confirming Koch’s postulates. Figure 5. Symptoms of Camellia associated with Botryospaeraceae species. Inoculation leaves of C. sasanqua (A-E) and C. japonica (F-J) after 7 days. Three months after inoculations, the plants had not yet shown symptoms. We will wait six months to determine if any symptomatology is apparent. If not we will repeat the test to corroborate this fact. This study represents an attempt to characterize the Botryosphaeriaceae species associated with foliar necroses and dieback of Camellia in Galicia, integrated by cultural, physiological and morphological characteristics and confirmed by molecular analysis. In the present work, four Botryosphaeriaceae species were identified from a combination of all these characters: Botryosphaeria dothidea, Diplodia mutila, Neofusicoccum luteum and Neofusicoccum parvum; of which only Neofusicoccum species have previously been associated with Camellia in Galicia (Pintos, et al 2012). In this way this study represents the first record of Diplodia mutila and Botryosphaeria dothidea causing Camellia dieback in Galicia. Also, the results show that the four Botryosphaeriaceae species isolated are important pathogens of Camellia and cause severe symptoms in artificial inoculations. It is hoped that this approach will also facilitate a better understanding of this cosmopolitan fungal family associated with Camellia dieback and therefore these results will be useful in future epidemiological studies and disease management of Botryosphaeriaceae species on Camellia. Therefore this fungus can also be taken into account in the development of the disease control measures in Camellia. We thank Ana García Servia and Bernabé Peón Pose for their skillful technical assistance. Armengol, J., Gramaje, D., Pérez-Sierra, A., Landeras, E., Alzugaray, R., Luque, J., Martos, S. 2008. First report of canker disease caused by Neofusicoccum australe on eucalyptus and pistachio in Spain. Plant disease 92(6):980. Armengol, J., Vicent, A., Torné, L., García-Figueres, F., García-Jiménez, J. 2001. Fungi associated with esca and grapevine declines in Spain: a three-year survey. Phytopathologia Mediterranea 40:325-329. Crous, P.W., Slippers, B., Wingfield, M.J., Rheeder, J., Marasas, W.F.O., Phillips, A. J.L., Alves, A., Burgess, T., Barber, P. and Groenewald, J.Z. 2006. Phylogenetic lineages in the Botryosphaeriaceae. Studies in Mycology. 55: 235-253. Cunnington, J.H., Priest, M.J., Powney, R.A. and Cother, N.J. 2007. Diversity of Botryosphaeria species on horticultural plants in Victoria and New South Wales.. Australasian Plant Pathology. 36:157-159. García F., Torres E., Martos S., Duque J. 2004. Evaluación de la especificidad de cebadores para la detección de hongos de madera de vid. Actas del XII congreso de la Sociedad Española de Fitopatología. Lloret de Mar. Luque, J., Girbal, J. 1989. Dieback of cork oak (Quercus suber) in Catalonia (NE Spain) caused by Botryosphaeria stevensii. Eur. J. For. Path., 19: 7-13. Moral, J., Muñoz-Díez, C., González, N., Trapero, A., Michailides, T. J. 2010. Characterization and pathogenicity of Botryosphaeriaceae species collected from olive and other hosts in Spain and California. Phytopathology. 100:1340-1351. Pennycook, S.R. and Samuels, G.J. 1985. Botryosphaeria and Fusicoccum species associated with ripe fruit rot of Actinidia deliciosa (Kiwifruit) in New Zealand. Mycotaxon. 24: 445-458. Pintos, C., Redondo, V., Aguín, O., Mansilla, J.P. 2011 a. First report of cankers and dieback caused by Neofusicoccum mediterraneum and Diplodia corticola on grapevine in Spain. Plant Disease. 95(10):1315. Pintos, C., Redondo, V., Mansilla, J.P., Aguín, O. 2011 b. First report of dieback on hybrid rhododendrons caused by Neofusicoccum luteum and Neofusicoccum parvum in Spain. Plant Disease. 95(2):221. Pintos, C., Redondo, V., Chaves, M., Rial, C., Aguín, O., Mansilla, J.P., Salinero, C. 2012. Camellia japonica dieback caused by Neofusicoccum luteum and N.parvum in Spain. International Camellia Congress, Chuxiong, China. Romero, M. A., Sánchez, M. E., Trapero, A. 2005. First report of Botryosphaeria ribis as a branch dieback pathogen of olive trees in Spain. Plant Disease. 89:208. Sánchez, M. E., Venegas, J., Romero, M. A., Phillips, A. J. L., Trapero, A. 2003. El chancre de encinas y alcornoques causado por Botryosphaeria spp. en Andalucía. Bol. San. Veg. Plagas. 29: 593-612. White , T. J., Bruns, T., Lee, S., Taylor, J. 1990. Amplification and direct sequencing of fungal genes for phylogenies. In: PCR protocols: A guide to methods and applications. San Diego, California: Academic Press 315-322. Zea-Bonilla, T., González-Sánchez, M. A., Martín-Sánchez, P. M., Pérez-Jiménez, R. M. 2007. Avocado dieback caused by Neofusicoccum parvum in the Andalucia región, Spain. Plant Disease 91(8):1052.